The worst part about a great bar is having to decide who gets to order cocktails and who has to order iced tea. 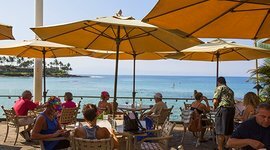 Maui is filled with fantastic bars and even better cocktails, but it’s so much easier (and safer!) when no one needs to drive afterwards. 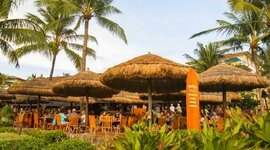 Lucky for you, many of the best Maui happy hours and delicious restaurants are located at resorts. 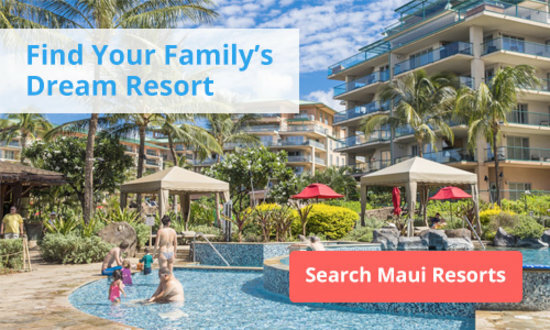 So before you decide where to stay, you might want to see if the resort has a good spot to enjoy a classic Hawaiian cocktail with the sand between your toes. Southside of Maui, steps from the beach, and the sunset is blazing up the sky. The only thing that really separates you from the beach at this easygoing resort is a stretch of lawn lined with palms and lounge chairs. Maui happy hours don't get much better than the one (or should I say two!) at 5 Palms. It's so good, they do it twice: First from 3-7 pm and again from 9-11 pm for a total of six happy hours! Highlights include $4 drafts from the local Maui Brew Co, and $5.75 Mai Tai’s. Their late night happy hour from 9-11 pm features 50% on their entire sushi menu, including sashimi, which is basically unheard of at most places. Plus you get drinks at happy hour prices too! What Maui happy hour special includes free whale watching? If you’re here from November to June between 3-6 pm, you may just see a pod of humpbacks in the distance as you sip a Castaway Cooler. Tucked away in Ka’anapali Villas Resort, this is a great Maui bar for anyone to find - not just vacationers. The dinner menu at the Castaway Cafe is small, but solid. They really nail the dishes here such as Garlic Shrimp and Hawaiian Style Cordon Bleu. Yum! Dennis is the Man! 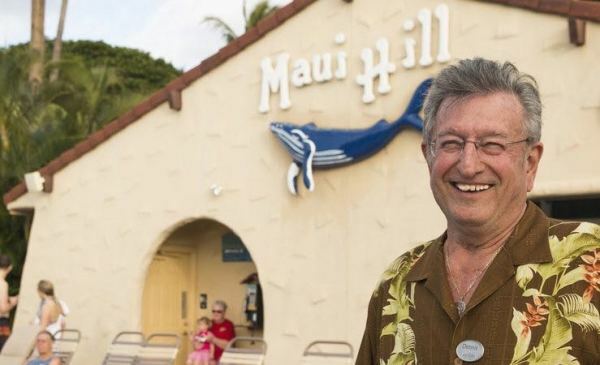 Seriously, the general manager at Maui Hill who hosts the resort’s happy hour is the reason why many people come back to this Maui resort year after year. 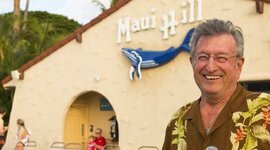 And once a week from 4-5 pm Dennis personally mixes a row of mai tais and chats with guests. 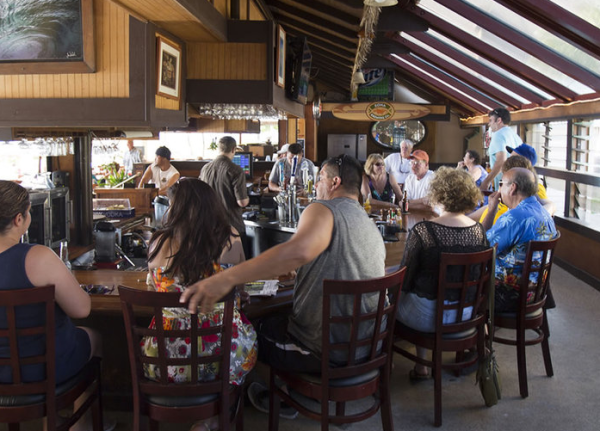 This is one of the happiest happy hours in Maui and provides guests with a great opportunity to meet new friends or bond with the family as live Hawaiian music plays in the background. 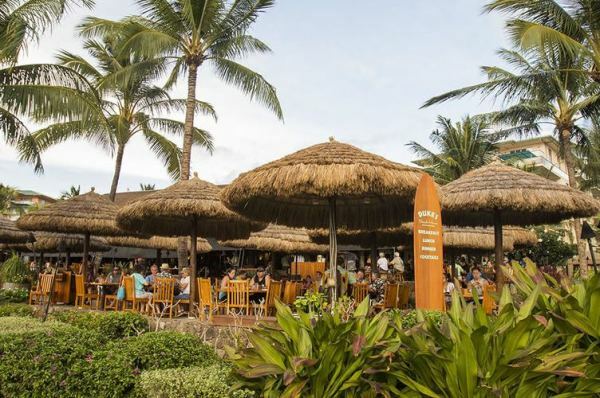 If your looking for the best Maui happy hour, this may just be it! Not only was Duke Kahanamoku a surfing legend, known for introducing the sport to most of the world, he was someone who exuded warmth and kindness everywhere he went. The happy hour at this beachside bar and restaurant of his namesake serves up a similar vibe. They put together seasonal cocktails that combine local ingredients from the island. This season’s speciality is the Wild Pua Martini: an infusion of pressed Asian pear, Grey Goose La Poire, Domaine de Canton ginger liqueur, homemade hibiscus simple syrup, and garnished with an edible hibiscus flower. 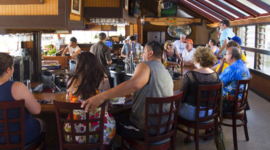 Located at the luxurious Honua Kai Resort on Ka’anapali Beach, Duke’s happy hour runs from 3-5 pm everyday and features live music. It’s a cute little restaurant at a family friendly resort by the ocean in Kahana in west Maui. After you’ve cooled off in the ocean and pool, and taken a dip in the jacuzzi, this is a great bar in Maui to finish off the day. It’s got a nice community vibe and the food is also pretty darn good. 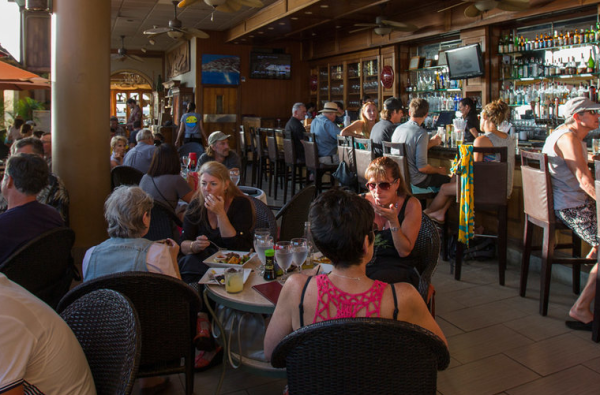 Looking for a mellow Maui happy hour? Come to the Sands of Kahana. Sitting out on the Napili Kai patio you’re treated to an amazing view of Napili Bay and at sunset the sky here lights up brilliantly. Happy Hour at this Napili Bay institution (2 - 5pm) features an exceptional selection of great cocktails - try the Sea House Punch! But the food here is what really sets it apart. You get a pretty significant discount on some delicious plates from this gourmet restaurant. Poke Nachos go for $7 and Calamari Tacos for $6, a much better deal than at many other places. View the Sea House menu. 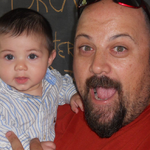 After traveling the world with his wife, Eric wanted to share that same love of travel with his two boys, Jonny and Oscar. As Vacatia's Marketing Manager, he gets to return to his roots as a journalist and travel writer. 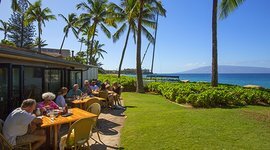 Walk along Ka'anapali beach for brunch at this restaurant. Get the Cinnamon French Toast for breakfast, or fish tacos for lunch. Right above the beach, you can watch the sunset over the ocean. Come at 3-7 pm or 9-11 pm for happy hour specials, or brunch for their "pour your own champagne" mimosa station. It's hard to be closer to the ocean without being in it. 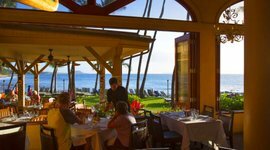 Sea House is known for its extensive happy hour menu and views of Napili Bay. The manager at Maui Hill resort puts on a weekly Mai Tai party with live music and free drinks. Seriously, Dennis is the the man! Right on Ka'anapali Beach, you can hear the waves as you dine. Try their seasonal specialty cocktail at happy hour, which runs from 3-5 pm everyday and includes live music. Tucked away in a nice family resort, this place is great for a drink and bite to eat by the pool.